Review by AllTheBestFights.com: 2016-06-03, two of the best muay thai fighters in the world in a very exciting fight with brutal exchanges and, probably, the best round of the year: Saeksan Or Kwanmuang vs Rodlek Jaotalaytong is one of the best muay thai fights of 2016 and it gets four stars! Saeksan Or Kwanmuang (also known as Seksan and with the red shorts – เสกสรร อ.ขวัญเมือง) should have a professional kickboxing record of 167-28-4 and he is ranked as the No.3 super featherweight in the world while unfortunately we don’t know the record of his opponent, the current Channel 7 stadium 130lb champion Rodlek Jaotalaytong (also known as Rotlek – รถเหล็ก จ้าวทะเลทอง), but he entered as the No.1 in the same weight class. Seksan fought twice in 2016 losing to Thanonchai Thanakorngym and winning over Thaksinlek Kiatniwat while Rotlek lost to Panpayak Sitjatik at the end of 2015 but then he has won three consecutive bouts. Saeksan vs Rodlek is the main event at the Lumpinee Boxing Stadium (Bangkok, Thailand). Watch the video and rate this fight! Review: 2014-05-02, two of the best muay thai fighters in a sensational fight thanks to some spectacular techniques, tough exchanges and brutal elbows: this is professional muay thai at his very very best and this is a candidate for Fight of the Year 2014, Pakorn vs Saeksan gets five stars!! Pakorn PKSaenchaimuaythaigym (red trunks), formerly known as Pakorn Sakyothin, had a record of 160-35-5 at the end of 2013 (unfortunately we don’t know the exact record of both fighters), in 2008 he won the Rajadamnern belt and on February 2014 he won the Lumpinee lightweight title defeating Singdam Kiatmuu9; Pakorn is ranked as No.3 super featherweight in the world. Saeksan Or Kwanmuang (blue trunks), had a record of 81-37-3 on April 6, 2013 (his last four-stars fight we posted: Saeksan vs Stephen Meleady) and he entered as the No.2 in the same weight class. In their first and previous fight Saeksan defeated Pakorn on April 4, 2014; this second bout is the main event at the Lumpinee Boxing Stadium (Bangkok, Thailand). Watch the video and rate this fight! 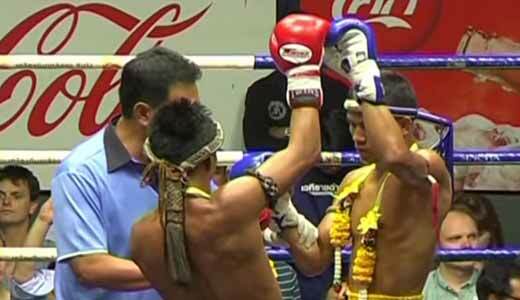 Review: 2011-09-01, the fight between Kaimukkaw Chuwattana and Seksan O.Kwanmuang was one of the best muay thai fights of 2011. Seksan (blue trunks) was dominating the early rounds, but in the third Kaimukkaw (red trunks) knocked down him with a nice elbow, Seksan survives and in the fourth round knocks Kaimukkaw out! Kaimukkaw Chuwattana is the former featherweight champion of the Rajadamnern Boxing Stadium. Watch the video!